The Skype team teased “exciting” news for Linux users, and it’s arrived. The old, outdated Skype for Linux application that’s barely been updated in years is being phased out. Replacing it is a new, modern Skype for Linux application that’s currently in alpha. Skype for Linux Alpha is based on the Skype for Web website, which Chromebook users can now use for voice calls. It works in web browsers on Linux, too. However, Microsoft isn’t just shrugging its shoulders and telling Linux users to load up the website. Instead, they’re building a sort of native application wrapper around the website to make it a first-class desktop application. The main new feature at the moment is a more modern interface. There are actually a variety of missing features over the previous Skype for Linux application, which Microsoft is working on adding. These improvements will also benefit Skype for Web for Chromebook users. Skype for Linux Alpha can only place voice calls, and only to clients that use the “next-generation calling architecture.” The latest versions of Skype for Windows, Mac, Android, and iOS will work fine, but you can’t use Skype for Linux Alpha to call users on the older Skype for Linux client. Video calls should hopefully arrive within a few weeks. They’ll then work on the web application for Chromebook users, too. Skype’s website includes a page with more information about available features. Aside from video calling, Skype for Linux Alpha currently doesn’t support calling telephone numbers, sending SMS messages, buying Skype credit, adding new people to an existing call, or changing audio device settings. These are all features that the current Skype for Linux application supports, and they should hopefully be implemented within a few months—after all, this is an alpha release. However, both versions of Skype do support one-to-one instant messages, group instant messages, emoticons, call forwarding, adding contacts, starting conversations, one-to-one audio calling, group audio calling, and sharing contacts. The new Skype for Linux Alpha also supports “new emoticons packs,” the one feature the list indicates is only available in the new application. That’s underselling it a bit, though—the Skype for Linux Alpha features a much more modern, smoother interface with support for easy file-sharing and other features. As it’s based on the current web application, the Skype for Linux Alpha only allows you to access 30 days of conversation history, which is what’s stored on Skype’s servers. The developers indicate they’re working on a way to store conversation history for longer. 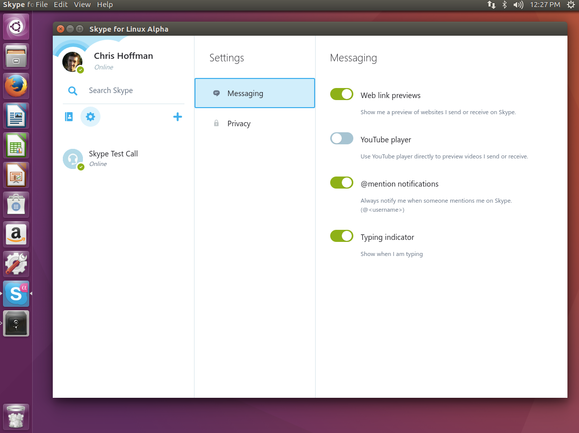 The settings screen in Skype for Linux Alpha is very bare-bones, and doesn’t yet offer many options. You can download it today, but bear in mind that this is alpha software. It’s available in both DEB and RPM package formats for a variety of Linux distribution. The DEB package has been tested on Ubuntu 16.04, Ubuntu Gnome 16.04, and Debian 8.5. The RPM package has been tested on Fedora 23, OpenSuse KDE 13.2, and OpenSuse Leap 42.1 KDE. It’s currently only a 64-bit package, and 32-bit Linux distributions aren’t supported. The Skype team may support 32-bit Linux distributions in the future, but they are being phased out. Over time, the new Skype for Linux Alpha application should become a superior option to the older Skype client. Yes, it may continue to lack some powerful features, but having a modern application where the basics actually work—a client Microsoft is actually actively developing instead of leaving to rot—will be a huge improvement.